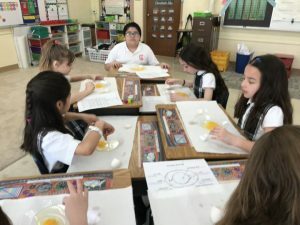 Students identifying the parts of an egg. 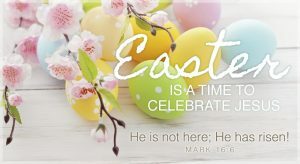 We wish everyone a Blessed Easter! We hope you enjoy the time off and make special memories. Religion: We will begin chapter 11, “The Parish is Our Home ” when students return from Easter break. Students will attend a School Mass on Friday, April 26th. The April prayer will be said on April 30th. FMSC Service Field Trip: We are delighted that so many of you can join us on our May 2nd field trip to Feed My Starving Children. Reading: Students will compare several poems with the nonfiction selection City Homes. They will continue to interpret literal and non-literal meanings, and use photographs and captions. Poetry: The April poems will be recited on April 30th. Grammar: Students will practice various skills as they complete the “I love Literacy” skills sheets. No quiz on Friday. Math: We will begin chapter 9 on Thursday. Students will be exploring fractions in more depth. No Simple Solutions quiz this week. 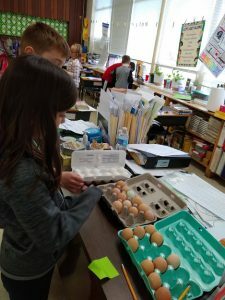 Science: Our eggs are in the incubators and students have been learning about them. We have white, brown and greenish blue eggs. 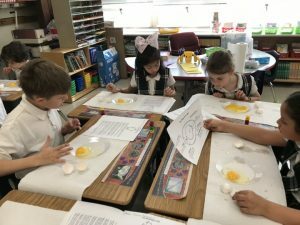 See the above photos of students locating the different parts of an egg. Students will have a quiz about the parts of an egg and their functions after we do some reviewing. 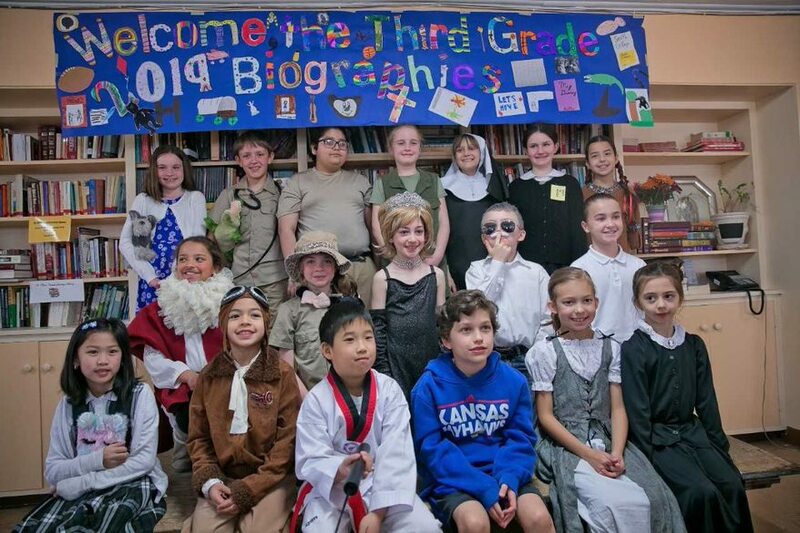 Social Studies: Students will be learning more about the different resources in our country and how to conserve them. They will also discover how people adapt to different climates.The unit test will be early the following week.
. April 15- 24th…….. A Blessed and wonderful Easter vacation for everyone!